Does your homemade chili bring tears to eater's eyes and not just because it's spicy? Is it the kind of chili that always gets rave reviews from dinner guests, family members and friends? 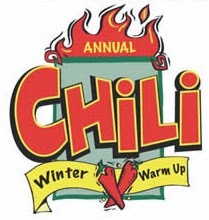 If that sounds like you, then the Chili Winter Warm-Up competition in Danbury wants you! Anyone can enter the competition - from regular folks to chefs and restaurants to nonprofits. Presented by the Danbury Westerners and the Danbury Sports Dome this annual event is Sunday, Feb. 23rd from 1-4pm at the Danbury Sports Dome. It's going to a great day filled with chili tasting (of course), music, entertainment, kids activities, vendors and more. And, if you're more of a chili eater than a chili master, you can go to the Warm Up for just $5 per person or $15 per family. You can pay at the door or grab your tickets early at www.eventbrite.com. For more info or to register your team, call 203-790-8342 or email Kay.Schreiber@sbcglobal.com. Wish Danbury wasn't so far!! This sounds like a fun event!